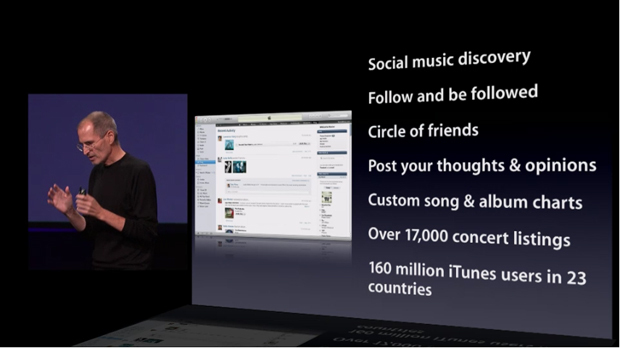 At the Apple press conference today, Steve Jobs unveiled Ping, a music social network seamlessly integrated into the latest version of iTunes 10. How do artists connect with their fans? Twitter? MySpace? Facebook? 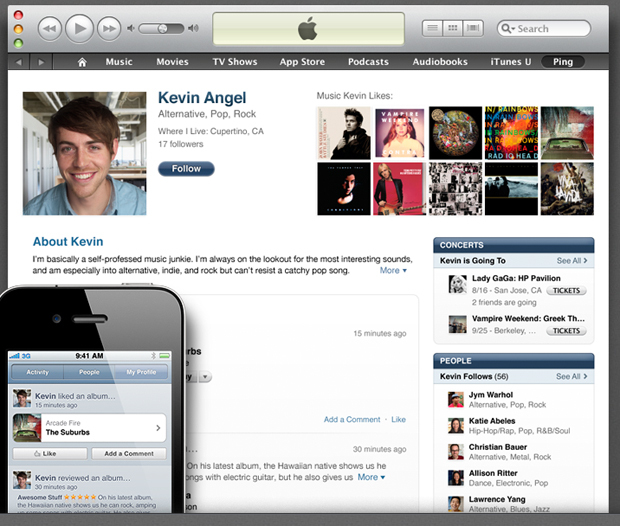 Try iTunes. 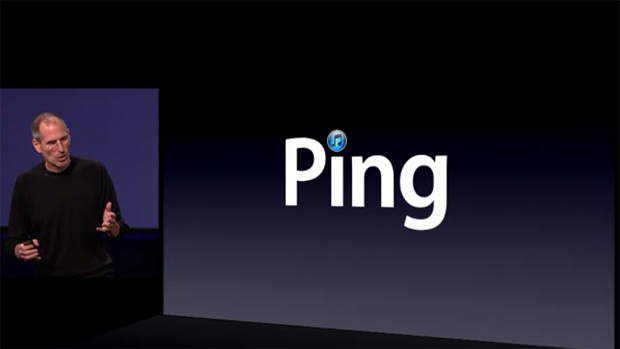 At the Apple press conference today, Steve Jobs unveiled Ping, a music social network seamlessly integrated into the latest version of iTunes 10. Consumers can use the service to follow friends and artists, post thoughts and opinions, view custom top song and album charts, as well as concert listings. Ping launches today, and with Apple’s massive leverage as the largest music provider in the U.S., iTunes will instantly become a huge competitor to other social networks, and a big asset for both consumers and record labels. 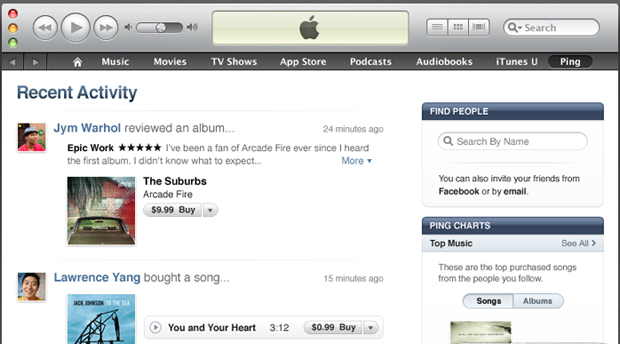 Ping is now a new button on the sidebar iTunes. When users click into it, they’ll be brought to a personal feed where they can find friends and artists. You’re a fan of Lady Gaga? Search for her name and begin following her artist page. You’ll be able to check out personal messages she writes to her fans, pictures and videos she posts, the music she’s listening to, and a list of concerts. Friends (famous or otherwise) can follow you as well, and vise-versa depending on what privacy settings you choose and who you approve. Everyone will appear in something called the “Circle of Friends.” What’s more, Ping is available on the iPhone and iPod Touch, enabling users to take advantage of the social network on-the-go. Major labels will certainly love this too. 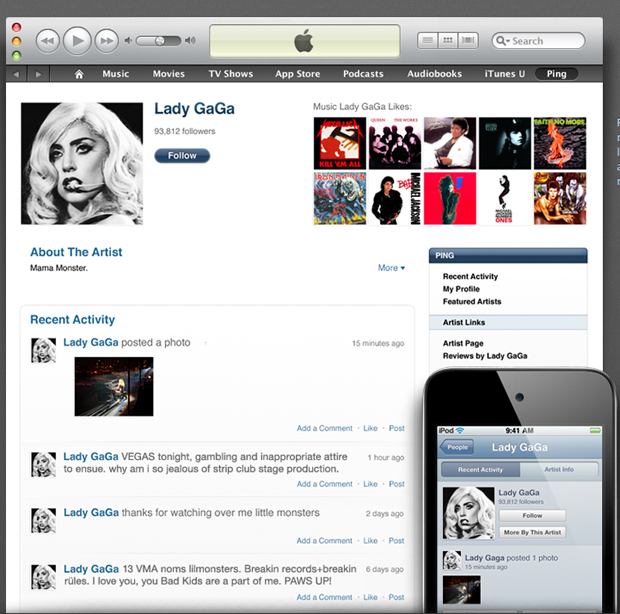 They’ve tried to take advantage of social media to market their artists, but combining social networking with Apple makes iTunes a one-stop shop. Plus, the service includes an Amazon-like friend recommendation system (above) that’s sure to bring in more sales. The big question: Will iTunes expand into other areas such as ticket sales? About 17,000 concert listings will instantly be featured on iTunes–but will we soon be purchasing them directly through the iTunes store instead of Ticketmaster? Regardless, even revealing those potential new sources of revenue, Jobs was ecstatic.